Welcome to Libertymind.com, the official website of The Liberal Mind: The Psychological Causes of Political Madness. Please take a few minutes to read about a book that will change forever the way you look at politics. The Liberal Mind is the first systematic examination of human nature and human freedom. It is the first book to explain why certain economic, social and political arrangements are compatible with human nature -- and why some are not. The Liberal Mind is the first book to explain how modern liberal collectivism undermines the legal and moral foundations of ordered liberty. The laws and moral codes--the rules--that properly govern human conduct arise from, and must be compatible with, the biological, psychological and social nature of man. The liberal agenda’s Modern Parental State violates all of the rules that make ordered liberty possible. The modern liberal agenda is a transference neurosis of the modern liberal mind, acted out in the world’s economic, social and political theaters. The liberal agenda’s Modern Permissive Culture corrupts the foundations of civilized freedom and is destroying America's magnificent political achievements. The liberal agenda’s basic principles are not only antithetical to our most cherished liberties; they are also directly contrary to all that is good and noble in the human enterprise. The Liberal Mind is the first work to explain why modern liberalism appeals to the irrational tendencies of the human mind. It is the first work to explain how liberalism can be defeated. In the course of this analysis, The Liberal Mind asks and answers the following critical question: Why would anyone want a political system that restricts personal freedom instead of enhancing it; denounces personal responsibility instead of promoting it; surrenders personal sovereignty instead of honoring it; attacks the philosophical foundations of liberty instead of defending them; encourages government dependency instead of self-reliance; and undermines the character of the people by making them wards of the state? The Liberal Mind contains the elegant solution to the problem of modern liberalism; it is a systematic, fact-based analysis of why the left’s collectivism not only does not work but cannot work. The two major goals of the modern liberal agenda: the Modern Parental Society and the Modern Permissive Culture, and why they violate the basic principles of freedom. How the modern liberal agenda attacks the moral and legal foundations of individual liberty. How the modern liberal agenda violates the defining characteristics of human nature and ignores the essential realities of the human condition. How the modern liberal agenda corrupts the character of the people by appealing to their base instincts and undermining the constraints of conscience. How the modern liberal agenda’s ideas and goals are self-contradictory and logically inconsistent. Why the liberal mind believes in the irrational principles of the liberal agenda -- and what it takes to effect a cure. 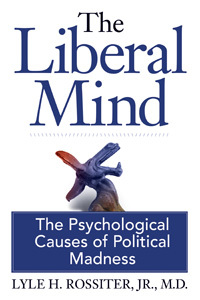 The Liberal Mind is the most comprehensive, intellectually-coherent analysis of political psychology ever published. The Liberal Mind will empower you to understand why the political madness of modern liberalism is destroying individual liberty in all corners of the world. What you will learn from The Liberal Mind is worth far more than its cost to you. Please act now, and we'll send you a paperback copy of The Liberal Mind for only $19.95 plus shipping. If you're still in doubt, please click on Praise and Kudos to read what others have to say about The Liberal Mind. The unexamined political belief is not worth holding. The unanalyzed political agenda is not worth promoting.